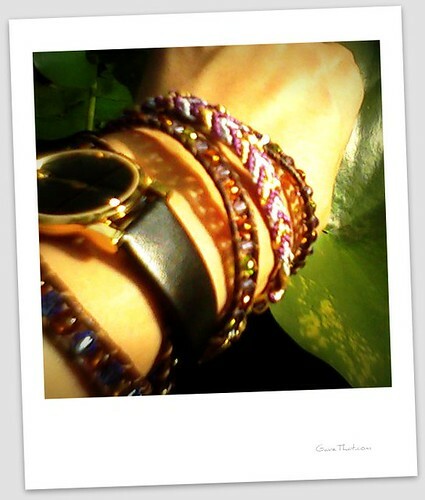 Over the past few months I've noticed an explosion of the childhood summer staple... woven friendship bracelets. Personally I'm ecstatic not only because of the fun memories of weaving and swapping but just the whimsy they add to life nowadays. Today I dug out my ancient copy of Laura Torres' "Friendship Bracelets" from Klutz (the best book if you want to whip up your own) and made the little lavender & gold chevron number above out of some silk embroidery floss laying about. These are actually very easy to weave by creating tiny knots. Somehow just the act of making them is deeply therapeutic in itself. I'm off to make another. Once you've made some you can take things to the next level and add some rhinestones... for that and another easier to make braided crystal wrap bracelet, see my tutorial here. 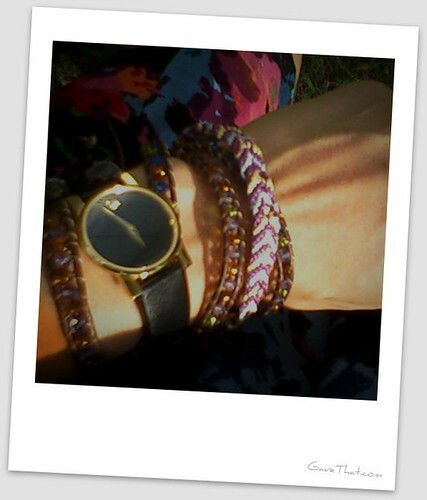 DIY silk floss friendship bracelet worn with a Swarovski crystal wrap bracelet & watch by Movado.